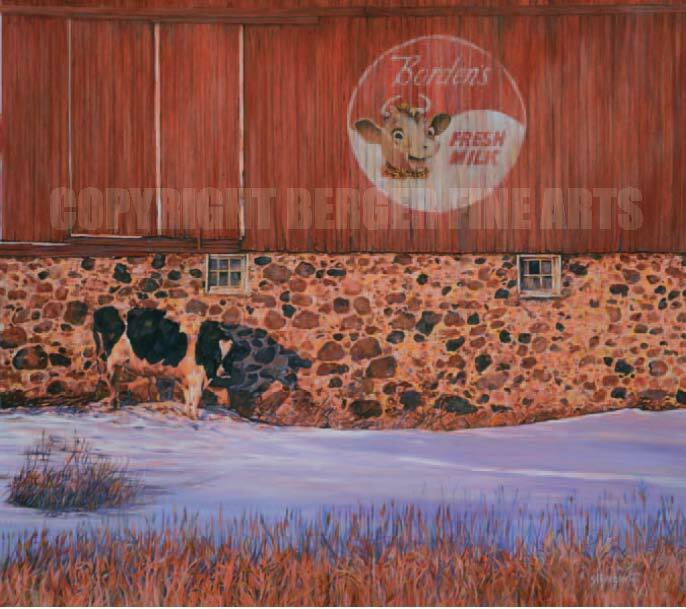 This is the newest of the "Farm Series" of paintings. If you grew up on a farm you know how cold it is on an early morning in January when the sun is just rising above the horizon. You also understand how it plays on all the usually vibrant colors of the farm but are muted temporarily by winter. This painting once featured "Elsie" looking down but it was too obvious for me and the composition so I ended up with this nice palette of reds, purples and cream colors. Signed prints of this piece will be available soon. 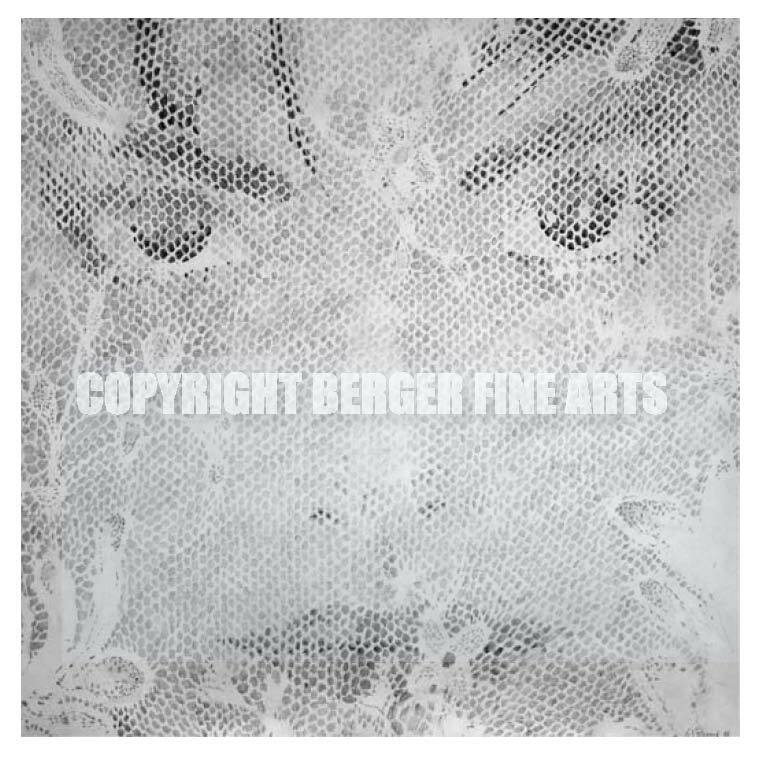 Watch the "Farm Series" on the "Berger Fine Arts website. This piece depicts a 1964 Ford Galaxy parked rather prominently on the "Field Of Dreams" baseball field in Dyersville Iowa. 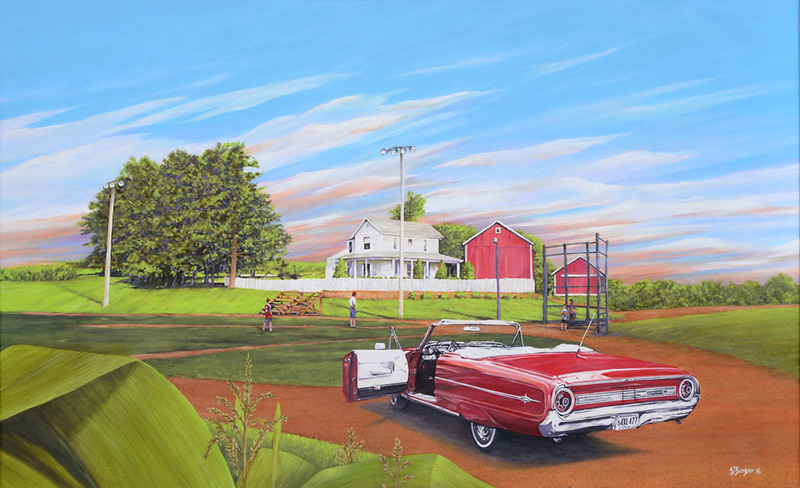 I was commissioned to create a scene with this beautifully restored Galaxy for the owner of the car and his family playing ball on the Field Of Dreams field " their favorite family movie. The car was sold and the family wanted something to remember it by. There is symbolism all over this painting the obvious being the open car door with the corn in the foreground. If you have seen the movie "one of my favorite movies also" you will understand the and symbolism and composition. I was disappointed when I visited the Dyersville field to see how much it's changed over the years. There are different buildings and t-shirt shacks all around the field. Needless to say I painted the scene the way it was in the movie. This was a 44" x 28" acrylic painting. This is another example of an idea sketch for a painting. 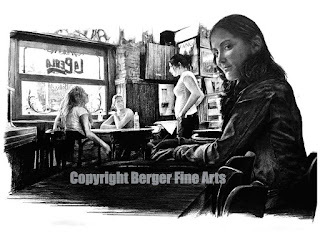 This 20"x20" pencil drawing is done on crescent board and was one of three sketches with this one being an early version which was never completed. The original painting went into an entirely different direction but it's one of those ideas left over that I would like to finish some day. All of my paintings start from ideas that are made into pencil sketches done on paper or what ever is that is available at the time. This enables me to work and think about how I want to draw the final piece. It also allows me to change pieces to the total composition before I commit the finished idea to paint. Not all sketches make it into paintings. Some are sold as is and some are sold along with the original finished painting when purchased. But then again I have a lot that I just decide to keep.